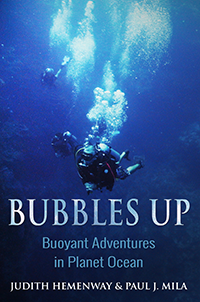 BUBBLES UP: Bubbles Up plunges you into the world’s oceans with longtime divers, Judy Hemenway and Paul Mila. Join them in the South Pacific and meet 30-ton whales eye to eye, dive into the Caribbean surrounded by hungry sharks, and turn back time as you explore a World War II Pacific wreck. Float serenely amidst the rainbow-colored sea life of a California pinnacle. Feel the thrill of an eagle ray flyby in Cozumel, Mexico, and experience the rush of a barracuda feeding frenzy. Whether you are a diver, snorkeler, or simply an ocean lover rejuvenated by a beach stroll or a swim in the surf, you will enjoy immersing yourself in these fascinating stories. Judy Hemenway and Paul Mila enjoy diving ocean waters around the world and have collectively logged over 2,000 dives. Their wide-ranging experiences inspired them to share their passion with others. When not diving, Paul writes thriller/adventure novels, works at a local dive shop, and coaches tennis. Judy, having retired, works at only what catches her fancy: she cultivates California native plants, tends her two desert tortoises, and plots when and where she will travel next. Diving Turtle Author – Judith Hemenway © 2019.